USS Arizona Memorial: The USS Arizona Memorial is a floating memorial built over the sunken hull of the Battleship USS Arizona, the final resting place for many of the ship’s crew. Battleship Missouri Memorial: General Macarthur accepted the unconditional Japanese surrender that ended WWII on September 2, 1945 on the Surrender Deck of the Battleship Missouri Memorial. USS Bowfin Submarine Museum and Park: The U.S.S. Bowfin (SS-287) is one of the 288 U.S. submarines that carried out the war in the Pacific during World War II. Here, you can explore the 10,000 square foot submarine museum to learn about the battle under the seas. Pacific Aviation Museum: The Pacific Aviation Museum is an immersive aviation museum complete with interactive simulators and exhibits showcasing the stories behind authentic WWII fighter planes and bombers. USS Oklahoma Memorial: The USS Oklahoma Memorial honors the 429 crewmen who lost their lives in the Pearl Harbor attack. Approximately nine torpedoes hit “The Okie,” capsizing this 35,000-ton battleship in only twelve minutes. North Shore and Haleiwa: The beaches of the North Shore stretch on for more than seven miles! That, along with 20+ foot waves in the winter make it an ideal surfing destination. In fact, the beaches of the North Shore host the world’s premier surfing competitions during the peak, winter months, including the Super Bowl of wave riding, the Vans Triple Crown of Surfing (November – December). But, the reason the North Shore is on our list of must-sees on Oahu is due to more than the waves. Haleiwa, the commercial center of the North Shore, is an eclectic, bohemian town known for its artsy, fun, casual culture. It’s important you venture out of Waikiki during your stay, and a visit to the North Shore is the perfect solution. Haleakala National Park: Haleakala is nearlky 10,000 feet above sea level, and the climate at this altitude is completely different than down below. Many visitors enjoy watching the sun rise from the peak — others prefer sunset. Either way, surveying Maui from above the clouds is an experience not to be missed. Haleakala encompasses more than 30,000 acres of public land, the park offers hiking trails, pre-arranged horseback riding tours and more endangered species than any other National Park. Just don’t forget your warm clothes! Hana, Maui: Driving the “Road to Hana” is on the bucket list for countless visitors, and it really is a must-do while you’re there. Yes, the road is long. Yes, it’s slow-going. Yes, it’s quite curvy (620 curves and 59 bridges). BUT, the road is dotted with beautiful waterfalls, and the reward is the town of Hana, where the pastures roll right up to the main street. The historic Travaasa Hana is a luxurious retreat in this village rooted in Hawaiian tradition. Browse the Hasegawa General Store and Hana Ranch Store for unique souvenirs. Swim and sunbathe at Hana Beach Park. Then, venture just ten miles south to the Pools of Oheo, where waterfalls spill into tiered pools leading to the sea. Or, hike up the Pipiwai Trail to the 400-foot Waimoku Falls. Iao Valley State Park: Located in Central Maui, just west of Wailuku, this peaceful 4,000-acre, 10-mile long park is home to one of Maui’s most recognizable landmarks, the 1,200-foot Iao Needle. This iconic green-mantled rock outcropping overlooks Iao stream and is an ideal attraction for easy hiking and sightseeing. 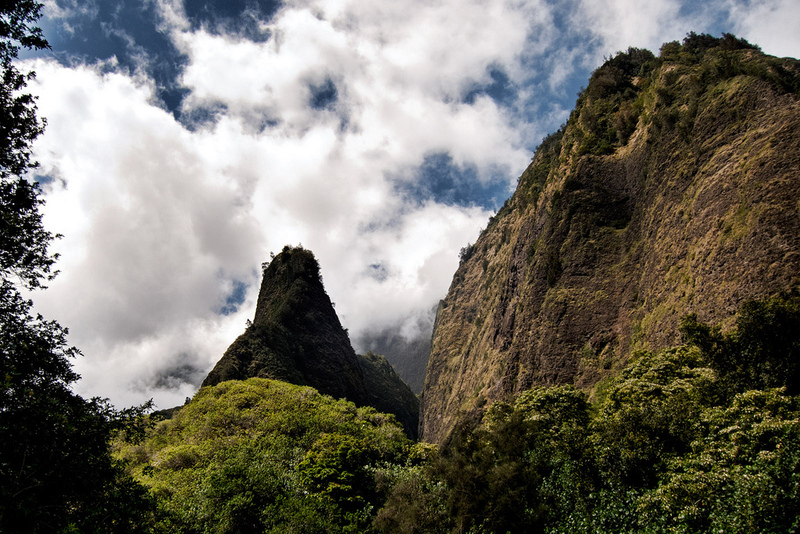 Iao Valley State Park on Maui was a sacred place for many ancient Hawaiians. The Iao Needled was considered a phallic symbol, and some believe you can increase your fertility by going there. Hawaii Volcanoes National Park: Founded in 1916, the Park encompasses 333,000 acres from the summit of Maunaloa to the sea. Here you’ll find 150 miles of hiking trails through volcanic craters, scalded deserts and rainforests as well as a museum, petroglyphs, a walk-in lava tube and two active volcanoes: Maunaloa and Kilauea. 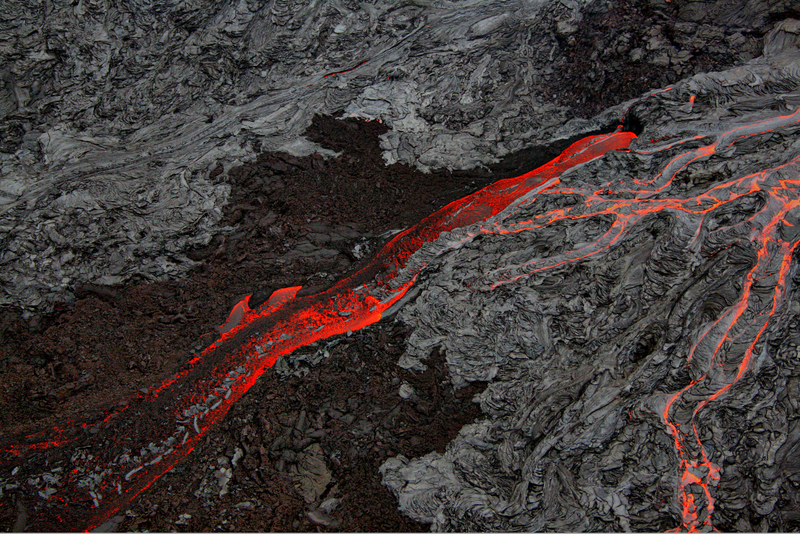 The Kilauea Volcano, which is still erupting, currently produces 250,000-650,000 cubic yards of lava per day, enough to resurface a 20-mile-long, two-lane road daily. At Hawaii Volcanoes National Park, you can view land being created in front of your eyes! Akaka Falls State Park: At Akaka Falls State Park, located along the northeastern Hamakua Coast, you’ll find apleasant 0.4-mile uphill hike that will take you through a lush rainforest filled with wild orchids, bamboo groves and draping ferns. You’ll first see 100-foot Kahuna Falls. Continue to follow the loop around the bend, and you’ll discover towering Akaka Falls which plummets 442-feet into a stream-eroded gorge. Beautiful Akaka Falls is perhaps Hawaii Island’s most famous waterfall. Easily accessible, this hike takes less than an hour. Puuhonua o Honaunau National Historical Park: This 180-acre national historic park was once the home of royal grounds and a place of refuge for those who broke the kapu, or sacred laws. To escape death, a kapu-breaker’s only chance for survival was to evade his pursuers and make it to a puuhonua, or a sacred place of refuge. Once there, a ceremony of absolution would take place and the law-breaker would be able to return to society. Explore the grounds including the Great Wall, standing 10-feet high and 17-feet thick. Fierce kii, or wooden images of gods, guard the Hale o Keawe Heiau, a sacred temple that housed the bones of 23 alii (chiefs). A black lava rock shoreline hindered kapu-breakers from approaching by sea. 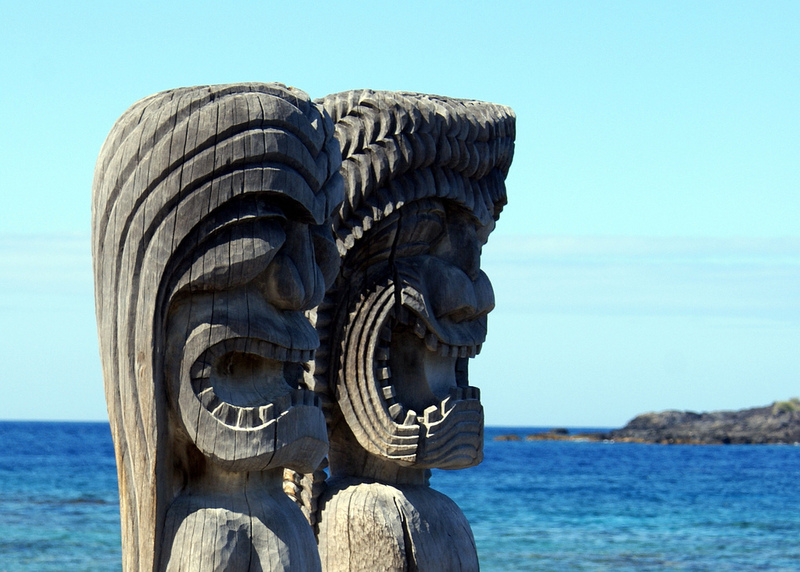 Beyond the puuhonua, explore the nearby Royal Grounds, which were the sacred home of alii. Puuhonua O Honaunau National Historical Park was known as the City of Refuge, where those who broke the kapu could escape death. Waimea Canyon: Waimea Canyon, on Kauai’s West Side, is described as “The Grand Canyon of the Pacific.” Although not as big or as old as its Arizona cousin, you won’t encounter anything like this in Hawaii. Stretching 14 miles long, one mile wide and more than 3,600 feet deep, the Waimea Canyon Lookout provides panoramic views of crested buttes, rugged crags and deep valley gorges. The grand inland vistas go on for miles. Fern Grotto: On Kauai’s East Side, the Fern Grotto is one of Kauai’s signature attractions. Accessible only by a short boat trip up the Wailua River, the grotto is a natural lava-rock grotto, lush with hanging ferns and tropical foliage, cooled by the mists of a waterfall. There was a time when the Grotto was off-limits to all but Hawaiian royalty. But for more than 50 years, riverboats have provided tours of the site. Daniel K. Inouye Kilauea Point Lighthouse: Perched at the northernmost tip of Kauai, the 52-foot Daniel K. Inouye Kilauea Point Lighthouse was built in 1913 as a beacon for traveling ships. Although its light was turned off in the 1970s and has been replaced by an automatic beacon, it still serves as one of the island’s most frequented attractions. The view off the rugged northern coastline and the deep-blue Pacific makes this the perfect vantage point for photos. This is also the location of the Kilauea Point National Wildlife Refuge, a sanctuary for seabirds. Keahikawelo (Garden of the Gods): Keahiakawelo, also known as Garden of the Gods, is an otherworldly rock garden at the end of rocky Polihua Road. 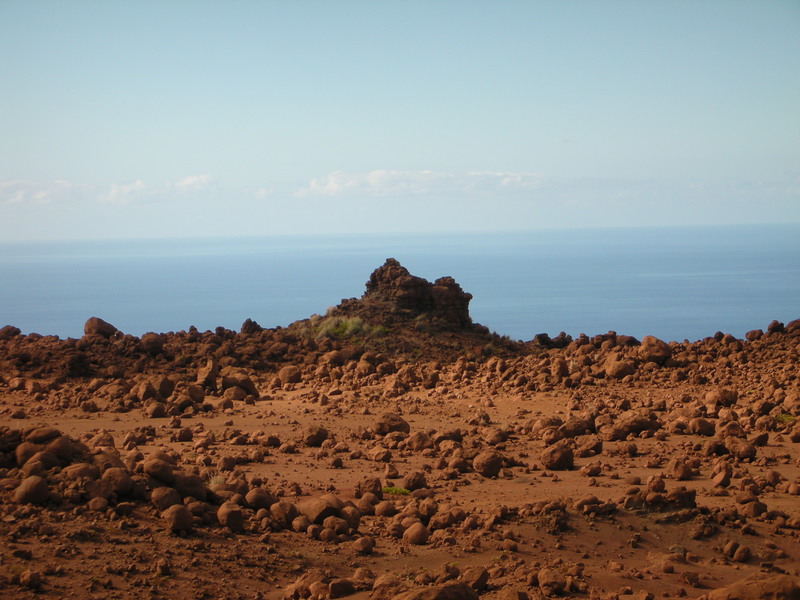 Located roughly 45-minutes from Lanai City, on the northwest side of the island, its mysterious lunar topography is populated with boulders and rock towers. According to Hawaiian lore, this windswept landscape is the result of a contest between two kahuna (priests) from Lanai and Molokai. Each was challenged to keep a fire burning on their respective island longer than the other, and the winner’s island would be rewarded with great abundance. The Lanai kahuna, Kawelo, used every piece of vegetation in Keahiakawelo to keep his fire burning, which is why this area is so barren today. At Keahikawelo, also known as Garden of the Gods, you can view what appears to be a lunar landscape. Puu Pehe (Sweetheart Rock): On the southern coast of Lanai is picturesque Hulopoe Bay and Lanai’s main boat harbor, Manele Bay. Rising from the sea just between these two bays is the iconic Puu Pehe, or Sweetheart Rock. Besides being a picturesque natural landmark, Puu Pehe is also steeped in Hawaiian legend (an ancient Hawaiian warrior hid his sweetheart away here, who drowned in the waters. Alas, the Hawaiian warrior plunged to his death off Puu Pehe). Kaiolohia (Shipwreck Beach): This windy, eight-mile stretch of beach has wrecked numerous ships along its shallow, rocky channel. In fact, the hull of a ghostly oil tanker from the 1940s is still beached on Kaiolohia Bay’s coral reef, its rusted hull giving the beach a surreal sense of wonder. Kalaupapa National Historical Park: This special community was once home to Belgian missionary Saint Damien and later Saint Marianne Cope. In 1873, Father Damien chose to leave the “outside world” to care for Hawaii’s Hansen’s disease victims who were exiled to this isolated peninsula. After 16 years of faithful service, he too, tragically succumbed to the disease. A few months before Saint Damien’s death, Mother Marianne Cope and her Franciscan sisters volunteered to live out their lives in the exiled community, operating the Boy’s Home he established and the Bishop Home for Girls. The beloved Mother died in 1918 of natural causes. Kaunakakai: This charming paniolo (Hawaiian cowboy) town is also the island’s main harbor, where some locals still fish for their dinner. Stroll down to Kaunakakai Harbor to the end of the state’s longest pier, extending well past the reef. The town’s main strip, Ala Malama Avenue, was named after the nearby house used by King Kamehameha V in the 1860s. You’ll find it easy to browse the shops and boutiques of its business district. Halawa Valley: It is believed ancient Polynesians settled in lush Halawa Valley as early as 650 AD. With many hidden heiau (places of worship) it’s easy to see why this area, half a mile wide and three to four miles deep, and blessed with beautiful vistas and towering waterfalls, is one of the island’s most historic areas. To be sure, there’s so much more to see and do than anyone can ever “list.” So, use these suggestions simply as guidelines for your trip to Hawaii. However, if you have the luxury of time, make sure you hit Hawaii’s most famous spots as you island-hop through the islands.